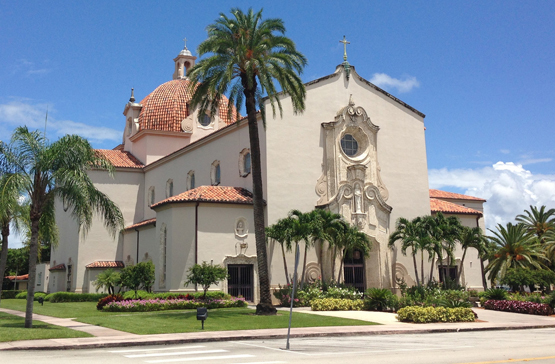 Established in 1926 at the request of a small group of Catholics in Coral Gables, the Church of the Little Flower was named by Archbishop Patrick Barry in honor of Saint Thérèse of the Child Jesus, popularly known as “The Little Flower.” Mass was celebrated in the convent library of Saint Joseph Academy, a boarding school established by the Sisters of Saint Joseph. Little Flower’s first structure, a parish center and auditorium dedicated in 1928, served as a temporary church. During the 1930s the Catholic population grew, and Mass had to be celebrated at the Tower Theater. During World War II, parishioners assisted the Civil Defense program, giving first-aid courses, making bandages, and serving as air raid and fire wardens. After the war, the parish constructed its long awaited church in 1951. The Sisters of Saint Joseph served in the school, renamed St. Theresa, for sixty-five years. The Carmelite Sisters of the Sacred Heart of Los Angeles assumed responsibility for it in 1991. The parish offers more than 50 organized ministries, services, and faith formation opportunities, including a vibrant Emmaus program for men and women, Marriage Covenant retreats in English and Spanish, adult education modalities, and Church of the Little Flower charities. La iglesia de Little Flower fue establecida en 1926 a solicitud de un pequeño grupo de católicos en Coral Gables, y fue nombrada en honor de Santa Teresa del Niño Jesús, conocida popularmente como “La Pequeña Flor” (The Little Flower). La misa era celebrada en la biblioteca del convento de la academia St. Joseph, un internado construido por las Hermanas de San José. La primera estructura de la parroquia (un centro parroquial y un auditorio) sirvió temporalmente como iglesia. Durante la década de 1930, la población católica creció y la misa debía ser celebrada en el teatro Tower. La Segunda Guerra Mundial trajo muchos soldados a Miami; durante la guerra, los feligreses ayudaban al programa de la Defensa Civil al ofrecer cursos de primeros auxilios, además de hacer vendas y servir como guardianes en la eventualidad de incendios y ataques aéreos. St. Joseph Academy fue llamada St. Theresa School, aunque las Hermanas de San José trabajaron en ella durante 65 años. Las Hermanas Carmelitas del Sagrado Corazón asumieron dicha responsabilidad en 1991. La parroquia ofrece más de 50 ministerios, servicios y oportunidades de formación en la fe, que incluyen un programa muy activo de Emaús para hombres y mujeres, retiros matrimoniales en inglés y español, educación para adultos, y las Caridades de la Iglesia de Little Flower. Legliz Little Flower te etabli nan lane 1926 apre demand yon ti gwoup katolik nan Coral Gables te fè, konsa legliz la te nome anlonè Sainte Terèse de L’enfant Jésus ke n konnen sou non Ti Sent Tèrez. Lamès yo te selebre nan yon ti bibliyotèk nan kouvan akademi St. Joseph, yon pansyon ki te etabli ak sè St. Joseph yo. Premye strikti pawas la, ki te yon sal pawasal ak yon sant biro, te sèvi tanporèman kòm legliz. Pandan deseni lane 1930 yo, popilasyon katolik la te grandi. Kifè mès yo te oblije selebre nan sal teyat Tower ki te pi gran. Dezyèm gè mondyal la te mennen anpil solda nan Miami, konsa pandan dezyèm gè a fi dèl yo te ede nan sendika Defans Sivil ki te ofri klas premye sekou, pou fè pansman, pou sèvis kòm ajan d’ sovtaj pou ensandi ak atak aeryèn. Akademi St. Joseph la te rele lekòl Ste. Thérèse, malgre se te sè sen Jozèf yo ki te responsab li pandan 65 lane. Apre sa se mè Kamelit Kè Sakre Jezi yo ki te vin pran larelèv nan lane 1991. Pou konnyè a, fi dèl yo patisipe na divès kalite apostola sosyal ak espirityèl, ki pami yo genyen retrèt Emaus, Sosyete Saint Vincent De Paul ak etid biblik.